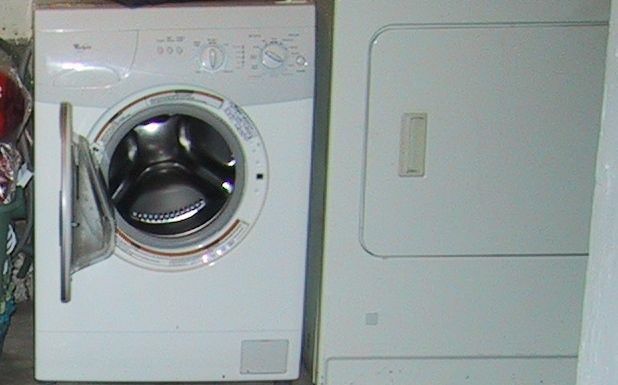 Here comes the “drama”… the washing machine is located in the basement, as many laundry appliances are. I have a walk-out basement, with a really narrow walk-out door. So, purchasing a washing machine wasn’t a really big decision – it was deciding between the very few washing machines that would fit through this door. The first machine I ordered did not. It also did not fit through the regular door at the top of the basement stairs. So, it returned to the store, and another one was ordered and delivered. Here comes the additional drama – the old washing machine also did not fit through the basement door. So, the dead washing machine and the new washing machine were now residing in the basement. Not that I don’t have the room, but I didn’t particularly want to start an appliance graveyard in my basement either. I didn’t particularly like the new washing machine. It seemed to need a lot of convincing to wash clothes, when I felt that was its job. I’d put clothes in the machine, add detergent, turn on the power and hit start… and it’d think about it. For a while. I didn’t have a lot of experience with front-loading machines, but it felt like it took a long time to think about washing clothes, before actually washing them. Then we had the floods. That didn’t help. The machine revolted, and now it refused to wash clothes unless you turned the cycle indicator to “stop” then to the cycle desired. That was annoying, but it also decided you needed to firmly (that is, slam) the door before it would recognize you did, in fact, want to wash clothes. Note it is important to have the spin cycle no higher than “medium”. Otherwise, the washing machine may wander off its elevated platform – or just get upset and quit. I don’t feel my past roommates or cleaning lady particularly cared for my washing machine, either. They did learn it’s idiosyncrasies, and managed to learn the whole routine of “turn cycle to stop, turn to cycle desired, slam door, wait, see if door locks, if not… repeat”. A few weeks back, the cranky washing machine decided it was going to stop between each part of a cycle. Washing a load of laundry had become a several hour ordeal. Now I put the clothes in, added detergent, turned cycle indicator to “stop”, turned cycle indicator to the cycle desired, slammed the door, pressed start… waited… if it didn’t lock, repeated… went upstairs… went back, the lights would be flashing and it would be stalled, full of water, and locked. Turn the cycle to “stop”, turn it to “spin”, press “start”, go upstairs. Check again later, see lights flashing. Turn cycle to “stop”, turn it to “rinse”, press “start”, go upstairs. Check again later, the lights would be flashing and it would be stalled, full of water, and locked. Turn the cycle to “stop”, turn it to “spin”, press “start”, go upstairs. This would be followed by a few more checks, to see lights flashing, try the “stop”/”spin” session again – until eventually I would have clothes that seemed kind of clean and not totally soaked with water. That was, needless to say, the last straw. When I’d had an enclosure built around the basement walk-out door some years back, I’d asked the contractor if he could enlarge the door at all. He was able to enlarge it a few inches – enough to remove the dead washing machine. That meant it was also large enough to purchase a new washing machine – one that wasn’t limited to one or two models. I did so. My new washing machine arrived this week, and yesterday I did two – that is TWO – loads of laundry in only a couple of hours. The new machine seems MAMMOTH in comparison to the old one, and it doesn’t seem to have to think much before actually washing clothes. It seems to understand its job is to wash clothes – that is its only job, to wash things. I hope this is the start of a beautiful relationship…. or at least, clean clothes. Farewell, washing machine. I will not miss you.